We’d love your help. Let us know what’s wrong with this preview of Security Analysis by Benjamin Graham. With nearly a million copies sold, Security Analysis has been continuously in print for more than sixty years. No investment book in history had either the immediate impact, or the long-term relevance and value, of its first edition in 1934. By 1951, seventeen years past its original publication and more than a decade beyond its revised and acclaimed 1940 second edition, a With nearly a million copies sold, Security Analysis has been continuously in print for more than sixty years. No investment book in history had either the immediate impact, or the long-term relevance and value, of its first edition in 1934. By 1951, seventeen years past its original publication and more than a decade beyond its revised and acclaimed 1940 second edition, authors Benjamin Graham and David Dodd had seen business and investment markets travel from the depths of Depression to the heights of recovery, and had observed investor behavior during both the calm of peacetime and the chaos of World War II. The focus of the book, however, remains its timeless guidance and advice--that careful analysis of balance sheets is the primary road to investment success, with all other considerations little more than distractions. The authors had seen and survived the Great Depression as well as the political and financial instabilities of World War II and were now better able to outline a program for sensible and profitable investing in the latter half of the century. To ask other readers questions about Security Analysis, please sign up. I'm new to investment, and I'd like to know what does the letter 's' after a number mean, as in 'Interborough Rapid Transit Company First and Refunding 5s ... (p.63)'? Thank you. Paul He was referring to a bond in the Interborough company. They yield 5% a year. The 6th edition (which is the 75th anniversary of the 1st edition) has an absolutely wonderful and very heartfelt introduction by Buffett. This is actually a reprint of the 2nd edition but annotated by revered investors/academics, which I enjoyed. I have to warn this is basically a textbook and will come across as very dry. The first few times I read Graham I thought it was very dry but I've acclimated myself to him and now enjoy his writing. Graham is always very careful never to inject any fla The 6th edition (which is the 75th anniversary of the 1st edition) has an absolutely wonderful and very heartfelt introduction by Buffett. This is actually a reprint of the 2nd edition but annotated by revered investors/academics, which I enjoyed. I have to warn this is basically a textbook and will come across as very dry. The first few times I read Graham I thought it was very dry but I've acclimated myself to him and now enjoy his writing. Graham is always very careful never to inject any flamboyance in his writings. He is, I believe, at heart a teacher (he taught at Columbia and UCLA for more than 30 years cumatively) but he was also a brilliant money manager. He invented the first hedge fund in the 20's (but doesn't get credit for it). Graham's style is like a scientist, if there is any doubt for a method, he will readily illuminate it for the reader. He is very understated so as not to ever elevate expectations for the student/investor. Getting back to the teacher, he wanted everyone to be able to apply his writings so the book is very quantitative (not heavy in math, just statements that can be delimited). I recommend Fisher for the qualitative. Graham addresses the qualitative in other writings, but the reader will probably pick up he is uncomfortable and/or apathetic with it and limits it as much as possible. Reads very much like a textbook, but a must read for anybody considering stepping outside the world of mutual funds and actually investing in individual companies by using a value based approach. This book will provide the basic tools on how to evaluate the intrinsic value of a company, which is the first step in determining whether a security is a worthy investment. Certainly not an easy read, but well worth the time and effort. I'm no investor, but I enjoy keeping up with the markets the same way some baseball fans like digging into stats and nerding out on numbers. And that's why I decided to pick up this book and start learning more about value investing from a classic source. Holy crap, I couldn't put it down and was surprised at just how simple it was. Now I do have training and experience as an accountant, so I wasn't worried about jargon or complicated math... more often than not the math and terms used in the fi I'm no investor, but I enjoy keeping up with the markets the same way some baseball fans like digging into stats and nerding out on numbers. And that's why I decided to pick up this book and start learning more about value investing from a classic source. Holy crap, I couldn't put it down and was surprised at just how simple it was. Now I do have training and experience as an accountant, so I wasn't worried about jargon or complicated math... more often than not the math and terms used in the financial industry are employed to turn relatively simple concepts into seemingly complicated and scientific ideas. Surprisingly, this book had almost none of that "look how smart my financial ideas are" type of vibe to it. It had very little jargon beyond the very basic stuff you'd learn in high school economics. I mean there is nothing here but practical advice that anyone should be able to understand. risk is unavoidable, diversify, dividends are good, look for intrinsic value but still consider the price of common stocks in your final decision... stuff that I think we now take for granted as common sense, but in 1934 was still not lay knowledge. Extremely hard to read, but well worth it. I had always intended to read Security Analysis, but due to the size of the book (over 700 pages), I did not get around to reading it until around 2008. It was well worth the read. True, some of the examples are dated, like the emphasis on railroad securities and some old accounting rules, but the underlying principles still apply today. The book emphasizes concepts, methods, standards, principles and logical reasoning, so it works in the current environment, just as it did when Graham and Dodd w I had always intended to read Security Analysis, but due to the size of the book (over 700 pages), I did not get around to reading it until around 2008. It was well worth the read. True, some of the examples are dated, like the emphasis on railroad securities and some old accounting rules, but the underlying principles still apply today. The book emphasizes concepts, methods, standards, principles and logical reasoning, so it works in the current environment, just as it did when Graham and Dodd wrote it in 1934. 2008 was a year of financial and real estate crises which lead to many people seeing huge declines in their 401(k) plans, causing some to note that the days of "buy and hold" are over now. Graham and Dodd commented on this long ago, noting that "the old idea of 'permanent investments,' exempt from change and free from care, is no doubt permanently gone." They believed in long-term investments, not trading, but still said an investor has to keep an eye on their holdings and can't just buy them and forget about them. This advice still holds true today. They also offer valuable advice on issues as diverse as market timing, intrinsic value, market behavior, analyzing a business, using quantitative and qualitative methods to analyze securities, how investment differs from speculation, key issues for fixed investments vs common stocks, the margin-of-safety principle, the importance of the balance sheet as well as the income statement in analyzing companies, the importance of comparing price to value, and many other concepts that would benefit investors of today. Without a doubt Graham and Dodd were wise men and they would still be wise men. That makes this book interesting regardless of age, but it has lost some of its significance. Not because they are wrong but because the things they are pointing out is of much less relevance in a world where fixed income securities are not mainstay investments, and where fixed assets are less important to a company's wellbeing than it used to be. So what is left? A lot of really wise advice of the general kind (see q Without a doubt Graham and Dodd were wise men and they would still be wise men. That makes this book interesting regardless of age, but it has lost some of its significance. Not because they are wrong but because the things they are pointing out is of much less relevance in a world where fixed income securities are not mainstay investments, and where fixed assets are less important to a company's wellbeing than it used to be. So what is left? A lot of really wise advice of the general kind (see quotes below). Unfortunately it's embedded in a very thick book and I wouldn't recommend anyone reading the whole book to pick out those advice unless they are really interested in investments, and in particular value investments and if they are, I hope they are already familiar with much of what Graham and Dodd write here. If from no other source, from The Intelligent Investor by the same authors. That book is much more general and easy to digest. "The future is often no respecter of statistical data." "When an enterprise pursues questionable accounting policies, all its securities must be shunned by the investor, no matter how safe or attractive some of them may appear." "Obviously it requires strength of character in order to think and to act in opposite fashion from the crowd and also patience to wait for opportunities that may be spaced years apart." "Because figures are used in this process, people mistakenly believe that it is “mathematically sound.”"
"... if the adviser knew whereof he spoke he would not need to bother with a consultant’s duties." "We and other investors today tend to focus on cash flow after capital expenditures (free cash flow), instead of earnings, to evaluate the investment merits of a business. One advantage of this approach is that it helps shortcut a good many games that management can play in reporting profits." "The basing of common-stock values on reported per-share earnings has made it much easier for managements to exercise an arbitrary and unwholesome control over the price level of their shares. Whereas it should be emphasized that the overwhelming majority of managements are honest, it must be emphasized also that loose or “purposive” accounting is a highly contagious disease." "Buying stock in new or virtually new ventures. This we can condemn unhesitatingly and with emphasis. The odds are so strongly against the man who buys into these new flotations that he might as well throw three-quarters of the money out of the window and keep the rest in the bank." A book that really touches the issue in detail, but it is still carrying old facts of 1920s-1940s. Hence its broad mention upon railroad issues, public utility is too stretched that I suspect would benefit little to the analysis of popular industries nowadays. In my opinion the recent edition of "Intelligent Investor" does better in updating and put some footnotes to adjust the statements with the now condition. In this book, even one of the co-author added to this edition humbly admitted that h A book that really touches the issue in detail, but it is still carrying old facts of 1920s-1940s. Hence its broad mention upon railroad issues, public utility is too stretched that I suspect would benefit little to the analysis of popular industries nowadays. In my opinion the recent edition of "Intelligent Investor" does better in updating and put some footnotes to adjust the statements with the now condition. In this book, even one of the co-author added to this edition humbly admitted that he had not completed reading this book until he were invited to write the chapter. And I think this book is too long for outdated information. Graham is an interesting author with original ideas and not afraid of challenging other's opinion and bluntly mention them in his book. The main purpose of Value Investing is to find securities in discount (lower market value than its book value/ working capital) to establish margin of safety in case of default. The goal is to maintain investment position, so any profit taking because of increase in principal is best avoided and strive to have continuous annual income instead; and only to sell the security when the earning power is likely to diminish or when the price is deemed too high above premium (it becomes speculative). I feel hesitated to read big part about bonds to this book; but the concept of Value Investing itself lies on a thorough fundamental analysis of the company. A clause in bonds' indenture, capitalization structure, or warrants attached to bond might affect stock so might as well getting to know them as well. Topics about Cash Flows and analyzing companies working with mostly intangible assets like software comp/ tech comp would be great complimentary reading to this classic (a.k.a outdated) book. The fact that the depression happened in Graham's time is now considered as only mild recession could probably change the analyses to stricker threshold. "In the spring of 1951, the Dow Jones Industrial Average stood at about 250.Professor Graham suggested his class at Columbia University Business School that maybe the student would benefit from delaying his investing career until after the Dow had completed ITS PREDICTABLE DECLINE to under 200, which had yet to happen in 1951. Warren Buffett declined the advice, and a good thing it was because the Dow did not return to 200 that year or in any year since. “I had about ten thousand bucks” when Professor Graham gave his advice, Buffett told the Wall Street Journal. “If I had taken his advice, I would probably still have about ten thousand bucks.” pg. 287, Introduction to Part III. I push myself to finish this book just before my birthday. 908 pages gifted to myself! Joy! The 6th edition is basically the 1940 2nd edition with a number of chapters, plus the appendix, removed to make room for contemporary commentary. The chapters are available as a separate download, nevertheless their omission is unfortunate as many of them are very informative and access to the separate material inconvenient. Certainly at least for the Kindle version, where size is not a concern, the omission is inexcusable -- and doubly so if you examine what it is that they have been left for. T The 6th edition is basically the 1940 2nd edition with a number of chapters, plus the appendix, removed to make room for contemporary commentary. The chapters are available as a separate download, nevertheless their omission is unfortunate as many of them are very informative and access to the separate material inconvenient. Certainly at least for the Kindle version, where size is not a concern, the omission is inexcusable -- and doubly so if you examine what it is that they have been left for. The commentaries read like little more than extended promotional blurbs and do not really add anything illuminating to the discussion. This is seen most amusingly in the final "commentary" on global investing, a topic understandably absent in the 1940 edition. Instead of correcting this shortcoming, a vague essay is offered which mostly rants about the difficulties - giving dated examples, in some cases from the 1980s - so much for updating Graham to today's markets. More alarmingly, one of the contributors notes that a certain practice is "an unacceptable risk for those of us who invest our own money alongside our client." The reader cannot fail to compare this statement with one made by Buffett in his commentary to Graham's Intelligent Investor, where he notes that a manager cannot afford to take risks precisely because it's not his money that is at stake, but his client's. It only shows how out of touch the editors are with Graham, in character if not in investment strategy. I read this book (and will be reading The Intelligent Investor) as they are the books that shaped Warren Buffett's career. This tome is thick and written in the 1920-30s, so it is a bit difficult to read; however, a careful reading will help an entrepreneur better understand how people can lie to you with financial statements. It was a seminal read for me and an important reading experience. As someone who only invests in private companies and owns no public stocks, I was hoping for a bit more da I read this book (and will be reading The Intelligent Investor) as they are the books that shaped Warren Buffett's career. This tome is thick and written in the 1920-30s, so it is a bit difficult to read; however, a careful reading will help an entrepreneur better understand how people can lie to you with financial statements. It was a seminal read for me and an important reading experience. Not a waste of time, but much more dated than the Intelligent Investors. I thought much of the good work done by the Intelligent Investor was weakened by the sanctioning of speculation. Also overly prescriptive and narrowly framed based on the valuation levels of the day. It's a little like reading the bible - some parts you can take literally (like say the crucifixion), others you can only take figuratively (like say the story of genesis or noah's ark) and others you must throw out entirely (li Not a waste of time, but much more dated than the Intelligent Investors. I thought much of the good work done by the Intelligent Investor was weakened by the sanctioning of speculation. Also overly prescriptive and narrowly framed based on the valuation levels of the day. It's a little like reading the bible - some parts you can take literally (like say the crucifixion), others you can only take figuratively (like say the story of genesis or noah's ark) and others you must throw out entirely (like say slavery or the Moses-led genocides). 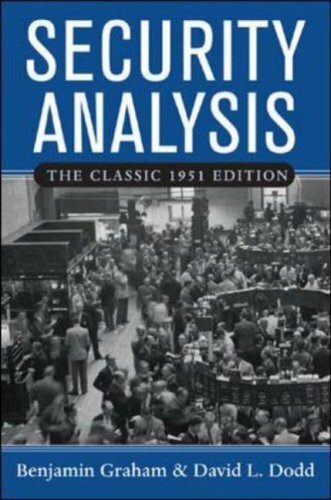 With nearly a million copies sold, "Security Analysis" has been continuously in print for more than sixty years. No investment book in history had either the immediate impact, or the long-term relevance and value, of its first edition in 1934. 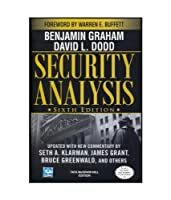 By 1951, seventeen years past its original publication and more than a decade beyond its revised and acclaimed 1940 second edition, authors Benjamin Graham and David Dodd had seen business and investment markets travel from the depths of Depression to the With nearly a million copies sold, "Security Analysis" has been continuously in print for more than sixty years. No investment book in history had either the immediate impact, or the long-term relevance and value, of its first edition in 1934. By 1951, seventeen years past its original publication and more than a decade beyond its revised and acclaimed 1940 second edition, authors Benjamin Graham and David Dodd had seen business and investment markets travel from the depths of Depression to the heights of recovery, and had observed investor behavior during both the calm of peacetime and the chaos of World War II. The prescient thinking and insight displayed by Graham and Dodd in the first two editions of "Security Analysis" reached new heights in the third edition. In words that could just as easily have been written today as fifty years ago, they detail techniques and strategies for attaining success as individual investors, as well as the responsibilities of corporate decision makers to build shareholder value and transparency for those investors. Security Analysis is not for the amateur or newbie investor wanna be. That being said, I didn't understand approximately 63% of it but the parts I did understand seem to me to be investing wisdom at its finest. If you are a seasoned investor, you will want to read this book and refine your skills. I'll come back to this one. This is a timeless classic. The principles contained in this book have stood the test of time. If you are a serious investor, you have to read this. There cannot be any greater learning. Great book for those who are interested in long-term investments. Certain understanding of financial reporting is required. The bible of securities investing i.e. studying financial statements and investing in stocks. Written in the 1930s. Still unsurpassed. I read the most recent 6th edition which is essentially an abridged 2nd edition plus some industry gurus' comments on each part and the relevance to today's investment. People also recommend replacing the first part of the 2nd edition with 3rd edition which is more detailed and comprehensive. Oftentimes referred to as the best of the many editions, I wanted to read this version because it was released 10 years after the start of the Great Depression. The 'links' between investing after the 1920s offer some insights into a similar period as investing after the massive technology bubble of the 1990s. Of course, we did not experience a global depression after the 1990s (due to Greenspan and the Greatest Global Boom of all time), but there are some common threads. In addition, Benjamin G Oftentimes referred to as the best of the many editions, I wanted to read this version because it was released 10 years after the start of the Great Depression. The 'links' between investing after the 1920s offer some insights into a similar period as investing after the massive technology bubble of the 1990s. Of course, we did not experience a global depression after the 1990s (due to Greenspan and the Greatest Global Boom of all time), but there are some common threads. In addition, Benjamin Graham is the Father of Value of investing. His students have amassed some of the greatest long-term returns in history (even during the secular bull market of the 1960s and 70s). This book is one the most recommended books when it comes learning about investing, and after reading it I now understand why does it get so many recommendations. Book is focused on helping us to learn about investing in Stocks and Bonds. Since I’m more interested in learning about investing in stocks rather than bonds, I will be more focused on covering that part in further review. This method is good method, but you’ll have to learn a lot about how to do research and find good companies at good prices. Inside the book author has suggested to looking at the Balance Sheet of the company; see what is Assets/Debt ratio, what is overall performance of the company; what are future plans for the business etc. You really need to understand overall business principles and that industry to have better understanding of what you’re reading. Problems might occur when management of the company can make misleading information about the state of the company through the accounting. There are so many factors that needs to be look out for when doing these type of researches and experience in any particular filed is a must have. Not all publicly traded companies managers and board of directors, CEO’s are working to benefit the shareholders and investors – that is something to keep in mind. The book offers some formulas and examples on how to look into Balance Sheets and calculate the Book Value of the Stock. This second type of investing is watching on the business cycle turnaround of one particular company, watching on the price of the stock, looking at what problems has occurred and why the stock price if failing. We all know that businesses went to cycles, it’s something that can’t be avoided; companies can’t maintain their growth forever – there’s simply the period of time when business will get through ruff periods and that is when we can look for our opportunity to invest. It’s important to not to speculate on the price of that stock, don’t get into “Buy Low, Sell High” and just get into buying the stock when you see that the price is fallen. There’s a reason why the stock price is down, and for how long will it go down. Don’t get yourself into “Dollar cost averaging”, because might dig yourself a grave doing that – because you simply don’t know for how long the price will go down, and how long will it take for that price to recover. Take some examples of stock prices from Dot Com bubble, majority of good companies still haven’t reached the prices from back than. So, it’s important not to speculate. You need to keep watching what is CEO and management doing; are they focused on resolving the occurred issues, what are they planning to do, how the are planning to execute those plans, how long will it take them to do it. If you see that CEO and management are interested in making the company get back on their feet, that you can’t take in consideration to invest in that company, you just have to wait the right moment to invest it. If you see that CEO and management are only interested in in their personal well being, and how to use company to make them self wealthier at the cost of shareholders and employees, than you might want to skip investing in that company. Reading through this book I got the feeling that the Graham and Dodd made the best money through the recession. This is the time where you can buy cheap stocks of good companies, but it does get with a greater risk. This comes down to really do research, create list of companies in which you are interested and keep watching them. You need to watch out what CEO and management of those companies are doing to get through difficult times. Good companies went bankrupt because they don’t have solution on how to sustain the business. That’s why it’s important not to get into buying as soon as the stock prices starts to go down. Choosing right type of companies and keeping those stock in your portfolio for the next 5-10 years seems like the best opportunity if things done properly and risk well managed. This is also mention in the book as good opportunity to cash in. Companies that are doing well and want do get more control over their business organize stock buyback – which leads to less stocks available in circulation, and price of those that are available will go up. But there are examples that is not that simple, and you shouldn’t went to buy stocks of every company that announce stock buyback. The problem will occur if the CEO and directors board have a large holding on them. They can manipulate prices like this, investors will start buying stocks and push the price up while the management of the company will start selling their share and capitalize on that. Eventually majority of people would end up with stocks that are worth less than they actually had paid for them. Read the classic version but found that the thoughts and standards of the time are far outdated from today's. The classic was written at a time when ticker tapes were in place, not when hundreds of billions of institutional funds move in and out of a country or industry equity sector within a week or 2. The principles are still true today as they were when they were first written, but context is what limits me from rating it a full 5! A clear, oh-so-thorough review of a field in which I have little to no knowledge or expertise. If you have the patience to make it through, it represents a worldview that I find very interesting--you can follow the paper trail to very what has happened, to understand a group of people's decision making in the present, and to make educated guesses as to what could happen in the future. Fascinating. This book has more useful, practical and well reasoned information per page than anything else I've read about investing. It is however a heavy book, both figuratively and literally. It's doubtful whether you can appreciate all of it without already having some meaningful experience. Probably worth reading multiple times over ones investment career. Czytałam znacznie dłużej, niż Regulamin tłoczni win Irvinga, i to pokazuje mój stosunek do tej książki. Trochę za dużo tu polityki USA z czasów wojny w Wietnamie, trochę za dużo tajemnic na siłę rozwiązywanych w ostatnim momencie i te dłużyzny mnie znudziły. Ale ostatecznie przeczytałam, bo język jednak Irving ma piękny i gładko prowadzi opowieść. Очень странно написанная книга. Вроде бы для профессионалов, но все разжевано очень сильно. Очень много специфики рынка США 70ых и 80ых годов, книга совсем не обновлялась с того времени. Прочитал начало, некоторые полезные вещи узнал, дальше только пролистал. The first edition was written in 1934, at the depth of the depression, which inspired Graham to search for a more conservative, saf This is probably the most famous book of all books in the investment arena, quoted as one of the most important books by several investment legends like Warren Buffet. Buffett who had Graham as a teacher, and who was his favourite student earning the highest grade was the only one to have been given an A+. After he graduated Buffett went on to work for Graham’s fund. The first edition was written in 1934, at the depth of the depression, which inspired Graham to search for a more conservative, safer way to invest. Graham agreed to teach at Columbia University with the stipulation that someone took notes. Dodd, then a young instructor at Columbia, volunteered. Those transcripts served as the basis for this book that “created” the concept of value investing. The second edition is a slight update, and considered by many to be the best. However, it’s over 70 years old, and personally I have always felt it rather dated and there are numerous other more modern value investing books that are easier to relate to. That’s why when this book, the 6th edition, arrived in 2009 I jumped with joy since almost everyone who is anyone in the value investing arena has contributed personally. Warren Buffett has written the foreword, Seth Klarman is the editor writing an excellent preface, and finally James Grant writes an intriguing introduction. Then follow comments from various famous people, putting Graham’s theories into a current setting. The book has eight parts, and the mission is Security Analysis, securities meaning stocks, bonds and variations of that. Roughly half of the book deals with stocks, and the other bonds etc. I think it’s enough to read part 1 – the essential lessons and part 5 – analysis of the income statement, if you are focused on stocks. The rest is either not equity related or to detailed and frankly sometimes boring. However the introduction to each chapter by current superstars is an easy must read. They give an up to date view on each part, its relevance today, where they agree and disagree, and how they use it in their current business. I would highlight Howard Marks text on bonds, Bruce Berkowitz who writes about stock dividends, and finally Bruce Greenwald who writes about the balance sheet and implications on valuation. David Abrams summed up Security Analysis the best when he called it "the value investors' equivalent to Deuteronomy" in his introduction to Part VII of the 6th edition. It is an extremely thorough explanation of how to evaluate stocks and bonds, primarily focusing on a company's income statement and balance sheet. It is not an ideal starting point for young investors–I have read several finance books before this one, and parts of it were still over my head–but it is essential reading for any ser David Abrams summed up Security Analysis the best when he called it "the value investors' equivalent to Deuteronomy" in his introduction to Part VII of the 6th edition. It is an extremely thorough explanation of how to evaluate stocks and bonds, primarily focusing on a company's income statement and balance sheet. It is not an ideal starting point for young investors–I have read several finance books before this one, and parts of it were still over my head–but it is essential reading for any serious investor. Graham and Dodd discuss the philosophy of value investing eloquently. They provide detailed analysis of dozens of companies' finance statements to support their arguments about how investors should analyze securities. It is an excellent reality check for anyone who thinks he knows a thing or two about investing. The examples given by Graham and Dodd are a bit dated (1930s), but most of the principles are still relevant today. The organization of the book is a bit awkward, but I don't presume that I could organize such a massive quantity and variety of material any better. The examples tend to be from the 1930's. Just surviving this period in the securities business was a major accomplishment. Simple mean reversion didn't work very well -- anyone who tried it was already gone. Meanwhile the examples are excellent. Especially the selections on 1920's mortgage backed securities -- yea they had them. Great knowledge from the Master Benjamin Graham himself but a very hard book to get through. I would read War and Peace twice again before attempting to battle through it again. But don't get me wrong he is the founder of value investing and Warren Buffet's Teacher! I'm probably the only person I know that could enjoy this book, but nonetheless, I found it very entertaining, despite its length. Don't read this unless you are very interested in the capital markets, though. It would be very boring. It is no doubt a classic, written so simply and touches on industry analysis which most books on investments miss out. Besides it deals with several aspects of getting to the roots of making a good stock selection. This particular edition is great in that it has the text of the second edition, but it also has the first ed In the forward to this edition of Security Analysis, Warren Buffett tells us that he has four books in his library that he treasures most. Two of those books are first editions: The Wealth of Nations and The Intelligent Investor. The other two books are both Security Analysis. One of those books was owned by Dodd and has notes throughout it to be included in the second edition of the book. This particular edition has a copyright of 2009, but it says practically nothing about the 2007-2008 situation. It would be great if the next edition also covered those years and if the editors would include a few color charts and graphs. It would also be great if all the articles referenced in the footnotes were included on the accompanying CD. Our library obtained this book from another library. I was the first ever to check this particular copy out. It has been sitting on their shelf nine years and never been opened. It is a pity that such valuable wisdom is sitting on a shelf and has never been read. You should be the one in your group to buck the trend and obtain this valuable information. This book showed the brilliance of Benjamin Graham, but you will need some knowledge in accounting before reading this. Must read for value investors wanna be. The first book to read to understand stock market and stock trends. The chart analysis is time-tested and is good for commodities and other futures. "There are no dependable ways of making money easily and quickly either in Wall Street or anywhere else." ...that doesn't mean it's impossible! 5 stars probably wouldn't be enough to rate this magnum opus from Benjamin Graham. Although this book is more than 700 pages, still, every pages provide techniques and guidance with great importance any investor needed. "Start analyzing a stock with a null hypothesis and rejecting it" is what this book is all about. Graham uses numerous examples and methods to guide the audience and investors to achieve this goal. So what is the "null hypothesis"? H0: Stock price, indicators and financial stateme 5 stars probably wouldn't be enough to rate this magnum opus from Benjamin Graham. Although this book is more than 700 pages, still, every pages provide techniques and guidance with great importance any investor needed. "Start analyzing a stock with a null hypothesis and rejecting it" is what this book is all about. Graham uses numerous examples and methods to guide the audience and investors to achieve this goal. So what is the "null hypothesis"? H0: Stock price, indicators and financial statements don't represent the whole picture of profitability. Every chapter, Graham teaches us how to uncover the hidden traps of financial statements, how businesses use different means to hide their true business performance. For instance, how companies use depreciation, reserves account and different accounting methods to disguise their losses or overstate their earnings. How balance sheets can show us the financial stability, the justification of their reported earning and the efficiency of the operation. An investor, like a scientist, required to check, compare and judge whether such stock is as good as the market claims to be by scrutinizing, rearranging and calculating the "intrinsic value" of the stock. "Systematic and hard work", Graham claimed, is the key in rejecting this null hypothesis. Yet, this book has been written for more than 80 years, some of the topics discussed may not be relevant or accurately reflect the modern stock market. The sixth edition, by providing an introduction prior each part from successful value investors in the information era, provided a great reconciliation between two time periods. In short, Great book and deserve to re-read it again and again! This edition keeps the spirit of Graham and Dodd's seminar work. I felt however that the new chapters don't add as much value as expected. A masterpiece on investing. Incomparable. Benjamin Graham is the God of investing. Any other comparison will not do justice to the master. Worth dusting off from time to time, to reinforce time tested stock market lessons. An essential for anyone interested in a career in finance. Graham and Dodd give a thorough overview of all the basics.